In spite of Prime Minister Meles Zenawi’s free market pretentions, the Ethiopian State is keeping control of the land. This gives it the freedom to attribute long term leases however it likes to foreign agricultural companies of its choice. A new activity is starting to make a splash, as a consequence of the rise in the price of cereals on the world market and the dearth of agricultural land in many countries: outsourcing food production. The government of the Ethiopian People’s Revolutionary Democratic Front (EPRDF) was one of the first in Africa to take up position in this sector by awarding long-term leases to large extents of arable land to foreign companies wanting to cultivate agricultural products for export. To be as competitive as possible, the EPRDF even accepted to rent this land for a very low price. This so-called “offshore agriculture” began to spread throughout the country at high speed, without nevertheless contributing any significant amount to the State budget. At the same time, food production for the internal market is still not enough to feed the whole Ethiopian population. Al Amoudi, pioneer in agriculture outsourcing. Already strongly implanted in the industrial sector in Ethiopia where he is by far the largest foreign investor, the Saudi magnate Mohamed Hussein Al Amoudi was the first to sniff out the good deal that is offshore agriculture. He persuaded the King of Saudi Arabia that he could help cut the country’s bill for importing cereal into the kingdom by producing, for example, rice in Ethiopia for the Saudi market. His company Saudi Star Agricultural Development wants to cultivate half a million hectares of Ethiopian land within the next ten years, beginning with 10,000 hectares of paddy fields in the Gambella region, along the Sudanese border. He obtained a 60 year lease at a peppercorn rent for this land coupled with authorisation to pump water from the River Alwero in return for selling a portion of the rice production on the local market. Another Al Amoudi company, Horizon Ethiopia, is vying for 100,000 hectares of land, again in the Gambella region, where it wants to cultivate oil palms. For his part, the Djibouti President Ismail Omar Guelleh has been attributed 3,000 hectares over a year ago to grow cereals near Serofta in the Oromia Regional State. Indians and Asians in the race. The largest Indian company operating in Ethiopia, Karuturi Global Ltd, is negotiating an allocation of 300,000 hectares in the Gambella region for an extremely ambitious agricultural project (corn, palm oil, sugar cane, etc) costing over $1 billion. This company expected to start its operations by working around a hundred hectares by mid 2011. The Indian magnate with Seychellois nationality, Chinnakannan Sivasankaran, known by the nickname Siva, is one of the investors who acquired agricultural land in Ethiopia. Meanwhile, an association of farmers from the Punjab is currently negotiating 50,000 hectares of Ethiopian land for a ridiculously low price: 25 to 40 year leases, rent free for the first five years then a rent of $9 per hectare per annum, tax exemption of imports and equipment, and tax exemption on exports. Under a similar process, the Singapore company Olam International Ltd, is planning to invest in coffee plantations in Ethiopia, while Chinese companies are looking to grow sesame seeds. However, not all of these projects will see the light of day and certain companies appear to be trying to speculate on land prices. The State has the high hand on land. 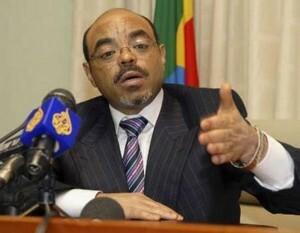 In spite of Prime Minister Meles Zenawi’s free market pretentions, the Ethiopian State is keeping control of the land. This gives it the freedom to attribute long term leases however it likes to foreign agricultural companies of its choice. The leases already attributed concern over 600,000 hectares, which according to the FAO corresponds to 1.4% of the country’s arable land. But the EPRDF’s aim is to rent over three million hectares of land by 2013. Officially, all this land was listed as wasteland, but that does not mean that it was not useful to the local populations, such as the Anuaks in the Gambella region who were neither informed nor consulted about these major agricultural projects. Furthermore, the issue of control and attribution of revenue from renting this land has still not found an answer. The Addis Abaaba federal government has admitted that had resulted in corruption. It has therefore decided to withdraw from the regional governments the right of attributing leases of over 1,000 hectares. However, the 2010 federal budget lists no income whatsoever, and no information on this subject appears in the quarterly reports of the National Bank of Ethiopia (NBE). Meles Zenawi is outsourcing the livelehood of millions. He is very happy as he pockets the money from the land sale. The farmers should rise up and reclaim their land. please remove the link above given by "Anonymous". It is insulting that anyone can take a short trip and speak on the conditions of the land and the people. It is time to respect the voices of the locals to speak for themselves. I am Ethiopian and hope other ethiopians on the ground can take this topic up as a research topic. Thank you forever to "Farmlandgrab.org" for your support and most of all for your respect to indegenous peoples of the world.